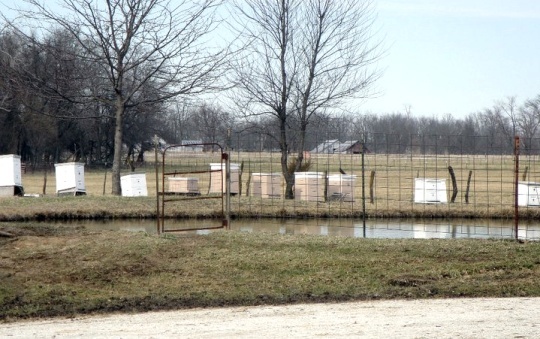 These hives are located on the Hilty farm, known as Hilty’s Bee Yard. 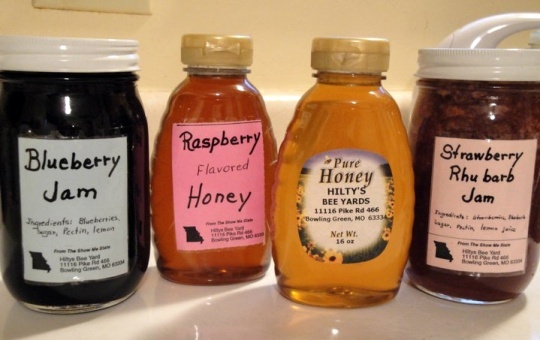 In addition to regular pure honey, Hilty’s sell Raspberry-flavored Honey (see below), Buckwheat Honey, and Wildflower Honey. How they differ in terms of flavor or healthiness I do not know. Any honey aficionados out there your input is welcome. The sweet stuff. Hilty’s also does a variety of jams as you can see. Personally I am quite partial to rhubarb in anything, but I know some that really dislike it. In case you were wondering, rhubarb in Polish is “rabarbar”. Poles don’t eat as much of it as the Amish do, but you see it occasionally. Though I love honey, I do not know much about the guys that make it. So I decided to do a little research. “Bee-bearders” place the queen bee in a container which they wear under their chin. I am no beeologist but imprisoning the queen and then inviting hundreds of thousands of the queen’s minions to frolic on your face seems like playing with fire to me. But apparently bees do not typically sting while swarming, because they’re full of delicious honey, or something. Let’s hope not. For me, I’ll stick with the honey. If anyone has tried Hilty’s stuff (or other Amish honey, for that matter), would love to hear about it. Read more on Missouri Amish. I am deathly allergic to bee stings but I love honey. I use honey in my home made bread instead of sugar. Yummy!! Just the mear sight of these pictures makes my stomach a little queezy thinking about what would happen if something ticked these bees off and they started stinging, LOL. No thanks!! I usually buy my honey down in Arthur. They sell honey for a bee farmer in Sullivan, IL where there are a few Amish living I believe. I am not 100% sure if the honey is actually “Amish” raised but it is local raised and that is good enough. The price is fair and the quality is excellent. I would never wear a bee-beard but I like honey too. Interesting that the Polish name for rhubarb is so similar to the Swedish one (rabarber) because there aren’t many words that are similar otherwise. In Sweden we jokingly say that Polish is the language where you take a perfectly normal word and then put as many z:s in it as possible. Elin, perfect description of Polish. Jam sweetened with honey is not a concept I’ve come across, I guess this is in opposition to jam sweetened with sugar? Sounds pretty healthy, though pretty sweet! I do not think I could eat a jar of jam, I need some sort of bland or salty alternative such as bread or peanut butter. Alice on the bees stinging I did not drill down too hard on it but it seemed to be that when they are in the swarm they are loaded down with honey, which makes them more docile? Maybe a bee-ologist reading this can confirm. – do they treat their bees against varroa mites in any way? – do they interfere with breeding or swarming other than natural? – do they suffer from CCD – Colony Collapse Disorder? – do they use honey extruders? Some of my friends are very interested in these facts, as this might be the answer to overcome modern beekeeping and its consequences. Thanks in advance – Klaus. P.S. If possible get me a direct email to an Amish expert. Hi Beth, glad you asked. That’s just my attempt at humor. The Ordnung is the Amish code of social rules which describes things like style of dress, technology allowed, etc. 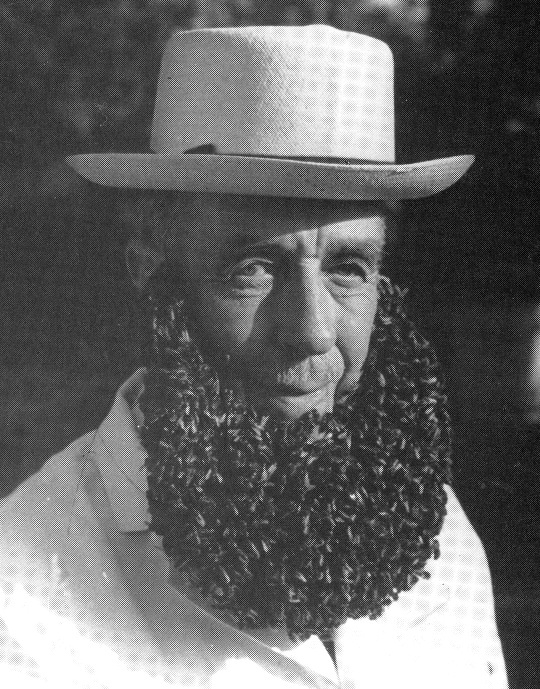 So I imagined this “Bee Amishman” might have an Ordnung of his own dictating the # of bees on a beard…ha-ha, right?? 😉 or maybe not! Generally bees sting in defense of their hive/queen. When they swarm, they haven’t yet established a new hive, so they are not as defensive. I have captured and hived swarms, and had bees pretty much all over my arms, but that was just business; I was not of a mind to play with them or take unusual liberties with them. I’ve only been stung when I accidently mashed one while working at the hive. I also learned not to try and work with them when I was in a bad mood. They seem to sense it and get upset; or maybe I’m just not as careful with them then as I usually am. A glass of warm water with a spoonful of honey and a spoonful of vinegar is a popular tonic here, taken daily. Forest, what is the tonic used for? You said taken daily !!!! I remember yrs. ago , a friend of my Dad’s used to eat a teaspoon of honey every day…..just said it was good for you …..
Have you heard that honey is good for cataracts??? I know you are not suppose to give a baby honey ……..
Doc Erik Wesner’s Miracle Amish Tonic! Good for what ails you, the remedy for worry, animosity, hypochondria, window and eye glass cleaning, cold sores, bad breath, a match for a mild coil of kielbasa for those who can’t or won’t drink wine, one of natures uplifting spirits and a source of a lively evening, midday or for those 4:00AM visits to Flossy the cow, available now in behind the Church wagon while the elders aren’t looking, available on the porch when they are but their wives aren’t! Doc Erik Wesner’s Miracle Amish Tonic! Forest thanks for the info on bee swarms. Honey enjoys the reputation of being an all-around healthy food (taken in measure, Yogi the Bear notwithstanding 🙂 ) Mona I had not heard that babies shouldn’t eat honey, is that true? Yoni, you have to enlighten me on goat beard…If it’s worse than a bee-beard, sounds pretty bad! 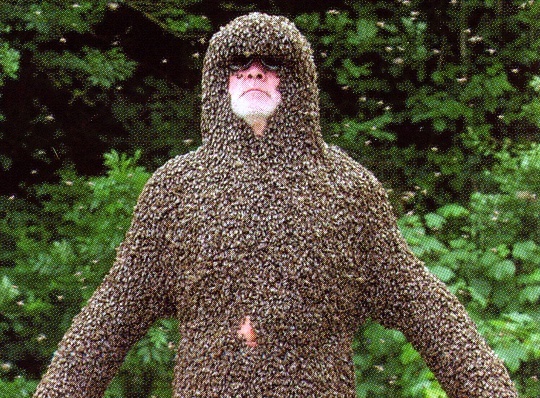 In reference to bee body-art: I really like seeing animals in nature but don’t think it is a good idea to wear them. On a different note, I really like Alice’s homemade bread with honey idea. I had never heard of that. Sounds fantastic! Thank you for writing on this topic Erik. I learned a lot. I always heard if you have bad allergies, to take a spoonful of honey made from a local producer a day. Though they stress it had to come from a local producer, as the bees would have been using the same pollen that your allergies react to. It apparently works to kind of build up antibodies to the pollen your allergies find irritating. I don’t have allergies these days (thankfully not too many lilac bushes in Chicago) so I can’t vouch for the effectiveness. Ugh, the bee suit freaks me out…obviously I watched Candyman a few too many times as a kid! I tried to write old timey when I wrote about Doc Erik’s tonic, that is were that came from, the idea of people hawking (in front of displays of the tonic in bottles, at circus, various other traveling shows or on their own) tonics that are either, for instance, honey and water mixture, or straight forward alcohol and selling it as a medicine or cure all remedy. I’m glad the humour was noted! From what I understand, a tonic is something one drinks as a medicinal beverage, it seems to me, in some cases, like Forest’s, tonics may be drunk like some people take vitamins or supplements for their health, or perhaps in Forest’s case because its always been done and it’s something people enjoy, in this case Forest’s tonic is homemade. Bees are intriguing and vital to growing fruit and vegetable plants. Nut trees need bees, and anything that needs pollination, depends on bees to do the job. The reasoning behind using local honey to relieve allergies is amazing. By the time bees have collectively gathered enough pollen to make honey, the pollen has been through the digestive system of seven bees. This is why the local honey, made up of the pollen in the area, and is raw, meaning it has not been heated or pasteurized, will act like an immunization shot for allergies to the local flora and fauna. The healing properties of honey helped a Dr. during the Civil War. He would have to remove limbs of injured soldiers, to save their lives. Amputations often got gangrene, a deadly infection, and all to often, the patients died. This Dr. would send officers off to find a bee hive. After the injured limb was taken off, the Dr. packed the stump with honey. Because the honey was anti-bacterial, no gangrene or other infections could cause death following a horrific surgery. My friend experienced the healing of honey. In an accident, part of his finger was sliced from the top. The Emergency room doctors sewed the pieces together. My friend began to have severe pain. Upon removing the bandages, he discovered a black and infected fingertip. So he had some local honey that was from cedar trees. He stuck that finger in the honey, and in three days it was no longer infected, and the finger healed. I keep raw local honey on hand. And I have an aloe Vera plant, too. It helps skin to heal. About babies and honey…I had a family day care for eleven years, and cared for 14 children at a time. The State of California Department of Social Services sent all facilities caring for young children a pamphlet informing us not to allow any honey, or products containing honey, to be given to children under 2yrs. Any child under 2 is counted as an infant, by the State. Their digestive systems are not able to metabolize and disarm any enzymes in the honey. There is much more to bees than we think. Sometimes the small things in life are the most important. It saddens me to know that the Amish are not allowing any education beyond 8th grade. There are many issues that are not inline with God’s word. That is why we arm ourselves with the Word, and Jesus, the Living Word. And there are many good things about education, especially when we learn more about the ways to be healthy, caring and bravery in the face of conflict. You can become a light source when others see Jesus in you. He prayed that we would be in the world, and not of it. He asked our Father to protect us in living life according to His Will. He lived among sinners of all kinds, and healed their hearts. We are Christians, and that means Christ-like. He did not put a wall surrounding Himself for protection. The Chinese did that, with a great wall, to keep others out. We need not fear anything or anyone, for the Lord is with us. And we can do all things in Him. It is time to live our faith. There are many that are lost all around us. We may be the only “Bible” some will see. When you have been given a gift from God, it is only profitable if we share it, with boldness and confidence. May the Lord of All be with you, and His peace in you. There may be a beekeeper between Harmony and Canton in southeastern Minnesota who sells honey. I believe they are Amish. They had a big sign along Hwy 52 that read, “Honey for Sale”. I would suggest calling the Visitor’s Center in Harmony at 507-866-2469 or 1-877-251-0606 to inquire about this. Would an Amish beekeeper wear a beekeeping suit?